Read our full report, Missing Out: Millennials and the Markets, and see the full research results. The savings and investmentInvestment An item of value you buy to get income or to grow in value.+ read full definition decisions that millennials make will have significant implications not only for themselves, but also for Ontario’s capital marketsCapital markets Where people buy and sell investments.+ read full definition and its economy. This report offers insight into the decisions Ontario millennials are making when it comes to saving and investing, as well as the attitudes and priorities that are driving these decisions. Its findings will help inform the Ontario Securities CommissionOntario Securities Commission An independent Crown corporation that is responsible for regulating the capital markets in Ontario. Its mandate is to provide protection to investors from unfair, improper or fraudulent practices, to foster fair and efficient capital markets and confidence in capital markets, and to contribute to the stability of the financial system and the reduction of systemic…+ read full definition (OSC)’s activities, and point to avenues for more targeted research on retail investor behaviour. 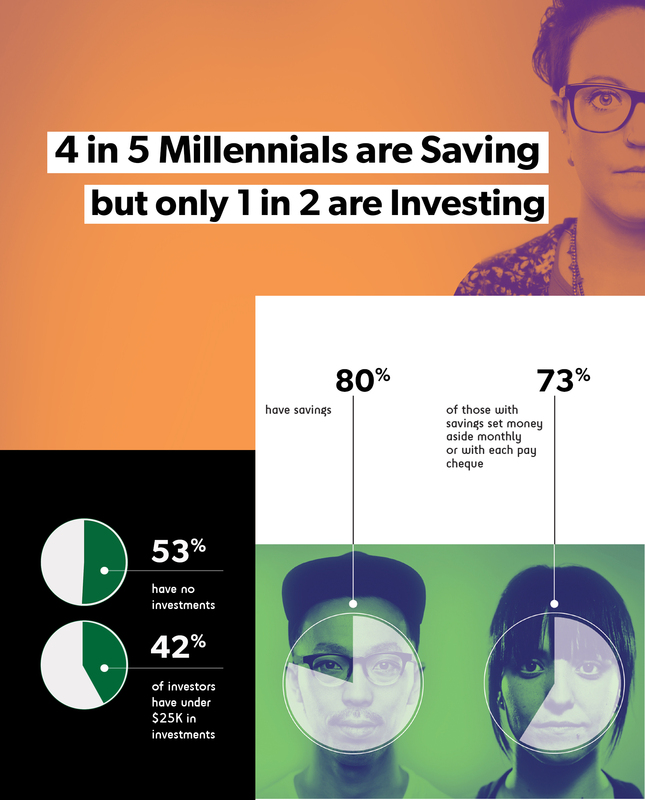 4 in 5 Millennials are Saving, but only 1 in 2 Millennials are Investing. Millennials tend to start saving from a young age, and many are saving frequently. This may reflect millennials’ focus on paying off debt as soon as they can, with 84% of millennials with student debt saying that paying off that debt is “extremely” or “very” important to them, and 21% of millennials identifying debt as a top financial concern overall. But high savings rates and low levels of non-mortgage debt have not led to high investing rates. Why Aren’t More Millennials Investing? 68% of millennials who don’t investInvest To use money for the purpose of making more money by making an investment. Often involves risk.+ read full definition said they have “other financial priorities,” and 53% cited debt as a specific obstacle to investing. 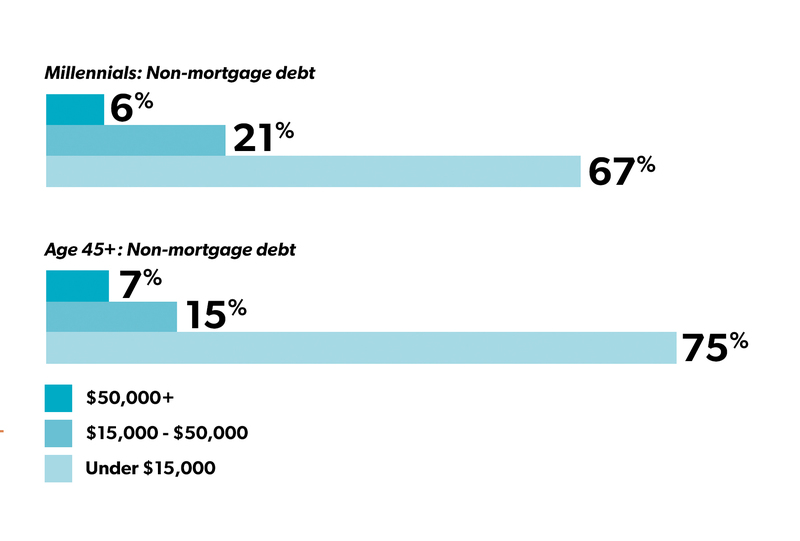 In addition to paying off debt, many millennials identified homeownership as a key financial priority. Some millennials may be putting off investing because they view saving cash for a down paymentDown payment The money you put into buying a large item like a car or home.+ read full definition on a home as a more urgent priority. 59% of millennials who don’t invest said they don’t understand enough about investing to get started. Relatively few millennials reported having high knowledge of investing or investment products (Fig.1). 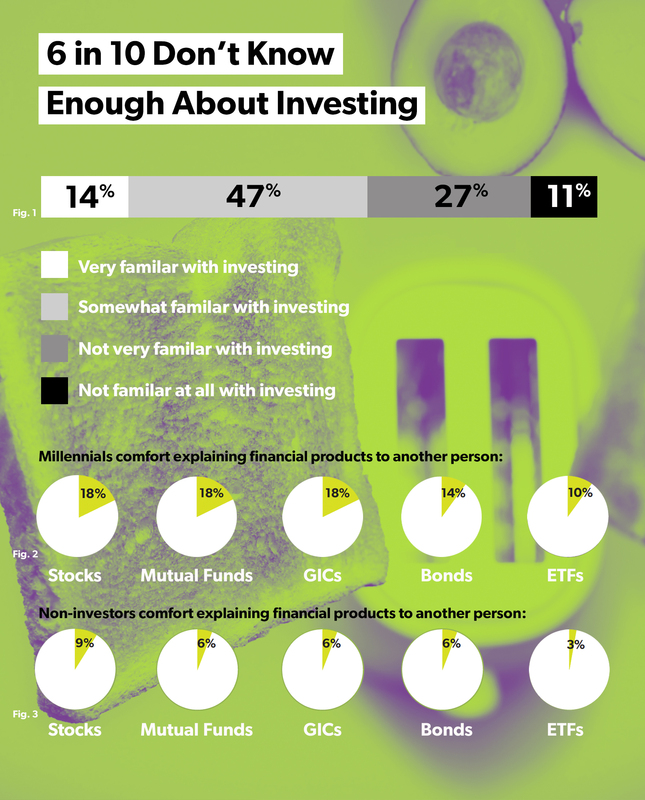 In addition, few millennials felt comfortable explaining common financial products to another person (Fig.2) These figures below include millennials who are already investors. 57% of millennials who don’t invest said they’re worried about losing money in the financial markets—even though younger investors generally are best placed to wait out losses and reap significant long-term gains in the markets—and 30% said they “don’t trust big banks or investment firms” with their money. Ontario millennials are doing a lot right. They’re saving, they’re focused on paying off debt, and they’re thinking about their financial future. Millennials can capitalize on this work by investing early in life, and taking advantage of the significant gains that can come with long-term investing—gains that can be important for meeting retirement and other savings goals. But our survey shows that many millennials are not taking advantage of this opportunity. 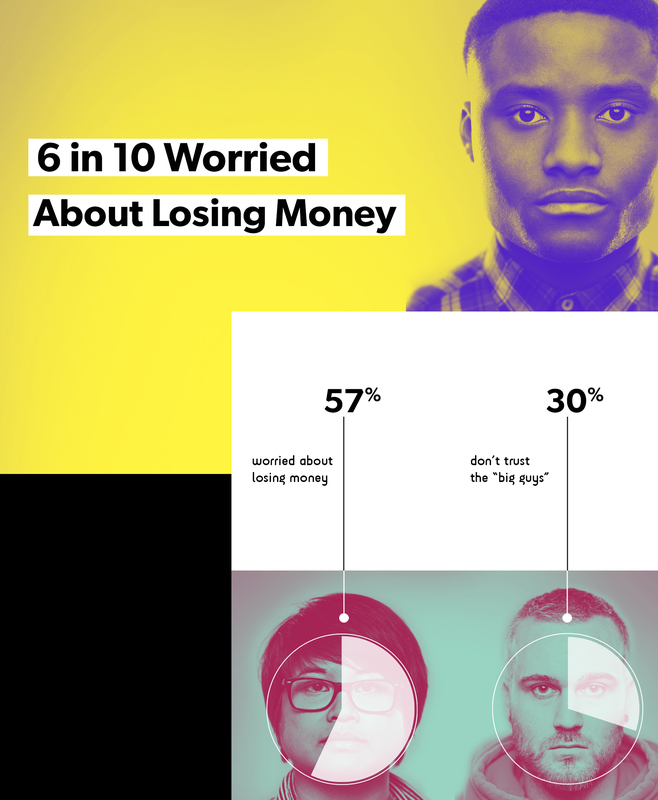 Our research results suggest that many millennials are avoiding investing because they feel they don’t know enough or haven’t saved enough to get started. Fintech tools that help millennials narrow down their investing options and find opportunities to invest smaller amounts could, in time, play a key role in encouraging millennials to invest. 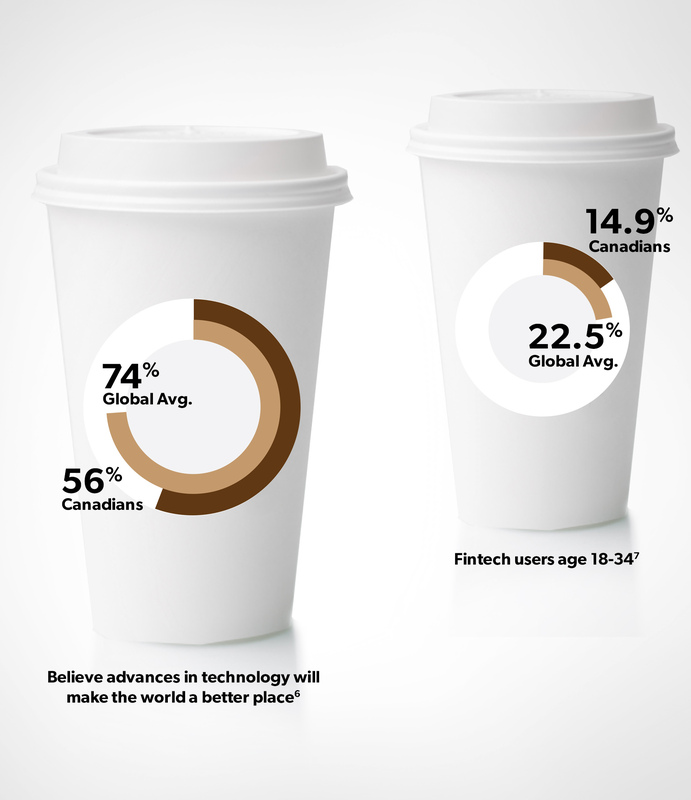 However, Canadian millennials may take more time to adopt new fintech tools than research on fintech adoption by millennials in other countries might suggest: Canadians tend to place less trust in technology, and Canadian millennials are less likely to use fintech, than the global average. Our research also found that many millennials are making use of more traditional advice channels, with 67% of millennial investors reporting that they currently work with one or more investment professionals, including 50% who report working with a financial advisor, 16% who report working with a portfolio managerPortfolio manager An investment professional who manages your investment portfolio. For example, they buy, sell and monitor investments that fit their clients goals and tolerance for risk.+ read full definition, and 12% who report working with a mutual fund representativeMutual fund representative Mutual fund representatives are registered to buy and sell mutual funds on your behalf. The companies they work for are registered as mutual fund dealers.+ read full definition. These findings indicate that millennials are not moving en masse into any single advice channel. Rather, they are likely to rely on a variety of different types of services to meet their savings goals. And while fintech may make it easier to access information on investing and invest small amounts, low savings and investing knowledge are not the whole story. Rising transit, shelter, and education costs, together with the growth of precarious employment,8 make it more difficult to save large amounts or plan for the future than may have been the case for prior generations. High mortgage debt imposes significant constraints on millennial homeowners’ ability to diversify their savings by investing in the capital markets. 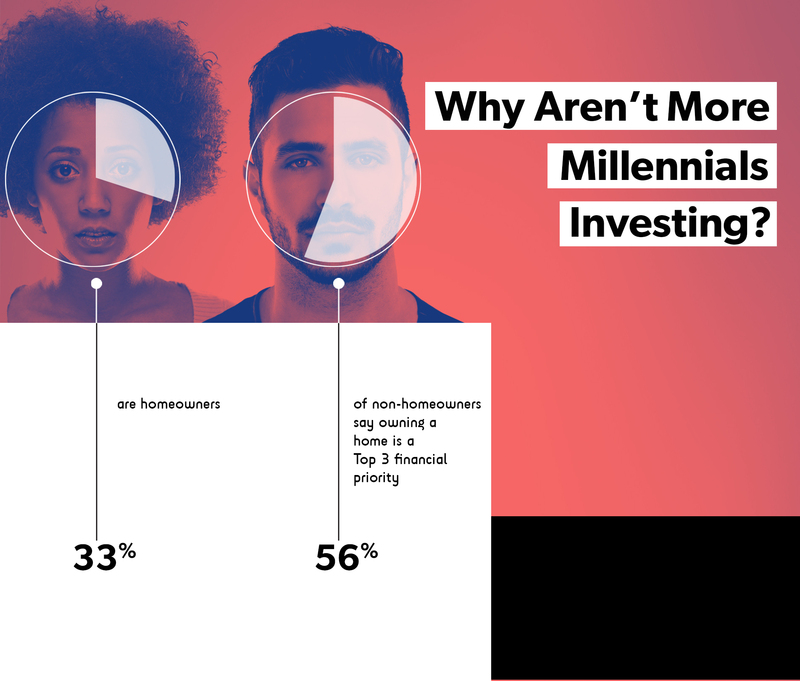 In addition, millennials reported a number of reasons why they are not currently investing apart from having to deal with higher short-term expenses, and these reasons could be connected. For example, low trust and optimism in financial markets could be contributing to lower financial knowledge among millennials: if millennials feel that financial markets are unlikely to benefit them, they may be less inclined to seek out information on investing. Low knowledge about investing may also be leading millennials to delay investing and focus on other financial priorities that they feel more confident understanding, such as buying a home. Millennials’ perception of the relative risks of different assets likely also influences their financial priorities. The OSC wants to learn more about the relationships between millennials’ attitudes towards investing and their investing behaviour. To this end, the OSC will be conducting more targeted research on harnessing behavioural insights to encourage more millennials to start investing. This research project is expected to begin by spring 2018. Financial professionals also have a long-term interest in learning more about what they can do to address millennials’ concerns about investing and about the financial sector more broadly. Financial markets, like all markets, move in cycles—there will be periods when investments tend to increase in value and periods when they tend to decrease in value. But younger investors are, on average, better placed than anyone to wait through periodic financial downturns and take full advantage of the long-term gains that can come from investing. Investing doesn’t mean becoming a day trader. It doesn’t mean reading the financial press every day, or spending time devising strategies for “beating the market.” For most people, it means making a plan and sticking to it: setting aside savings on a regular basis for investments and resisting the temptation to chase after trends or panic at bad news. There is no better time to learn more about investing than now, whether by talking to friends and family, doing independent research, or contacting a financial advisor, whether in person or online. Tips for avoiding getting side-tracked from your long-term financial goals. Our Interactive Investing Chart also illustrates the potential benefits of investing early in life and for the long term. This report has been prepared by the Investor Office of the OSC and incorporates data from an online survey conducted by Innovative Research Group Inc., as well as other research collected by the Investor Office. The survey was conducted online among a representative sample of 1,585 Ontarians, age 18 to 36, between May 5 and 12, 2017. The sample has been weighted down to n=1,500 by age, gender and region using the latest Statistics Canada Census data to reflect the actual demographic composition of the adult population 18 to 36 residing in Ontario. 1 Environics Analytics, Millennials: The Newest, Biggest and Most Diverse Target Market (2016), p. 5, http://bit.ly/2jkmz1r. 2 Statistics Canada, CANSIM Table 205-002: Survey of Financial Security (2012), http://bit.ly/2uJjeCt (Survey of Financial Security). “Households under 35” are households where the major income earner is under age 35. 3 See, e.g., Vancity, Arrested Development: the impact of affordability on millennial living (2016), p. 3, http://bit.ly/2fMxeEu; Tom Zizys, Metcalf Foundation, Better Work (October 2014), at p. 77, http://bit.ly/2A8HQqt. 4 OSC Investor Office, Investing As We Age (September 2017), pp. 37-38, http://bit.ly/2xBCIt7. 5 UBS Wealth Management Americas, Press Release, “UBS Investor Watch Reports Millennials Are As Financially Conservative as Generation Born During Great Depression” (27 January 2014), http://bit.ly/1jA82KF. While this study focused on U.S. millennials, studies on Canadian millennials had similar findings: see Cindy Crean, “A letter to my younger self: lessons in life, money and investing,” Sun Life Global Investments (2016), http://bit.ly/2yjbtRc; Lori Landry, “Sounding Board: Millennials’ tendency to invest like Grandpa a challenge for financial industry,” Benefits Canada (20 September 2016), http://bit.ly/2zoszOU; BMO Wealth Management, Make better investment choices by understanding and reducing bias (October 2017), p. 5, http://bit.ly/2yIhYRQ. 6 HSBC Canada, Press Release, “Global study on trust & tech: Canadians twice as likely to trust a robot to perform open heart surgery than to open a bank accountAccount An agreement you make with a financial institution to handle your money. You can set up an account for depositing and withdrawing, earning interest, borrowing, investing, etc.+ read full definition for them” (24 May 2017), p. 2, http://bit.ly/2wgpP6G. 7 Ernst & Young, EY FinTech Adoption IndexIndex A benchmark or yardstick that lets you measure the performance of a stock market, part of a stock market or a single investment. Examples: S&P/TSX, S&P/TSX Canadian Bond Index.+ read full definition: Canadian findings (2016), pp. 1-2, https://go.ey.com/2w0IpxA. 8 Vancity, note 3 above, p. 3; Zizys, note 3 above, p. 77.